A right recruiter is one who can get you closer to your dream job. If you’re a professional and do not have a LinkedIn account then you really don’t exist. LinkedIn is a digital landfill where professionals dump their resumes and pictures for recruiters to hunt through. The Jobvite survey in 2014 of about 2135 adults, mentioned that 94 percent of recruiters used LinkedIn to source candidates where 36 percent of job candidates are active on LinkedIn. Hundreds and thousands of jobs are posted by corporates on these professional websites, apart from this they also pick and scan profiles of candidates which match their requirements. LinkedIn is thus a big opportunity for professionals to get to a higher degree in career. Let’s glimpse through few aspects which recruiters want to see in your LinkedIn profile. What recruiters want to see on your LinkedIn Profile? 1. Headline: The headline of LinkedIn is one that comes along with your profile and is very important. The headline will usually bear your name and job title in it. 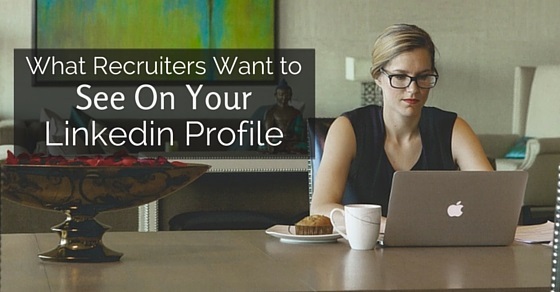 This data is important as recruiters look at this and decide whether to read through your profile or not. Your headline should have a few words that tell the recruiter about your related industry. For example, mentioning just “accounts manager” will not work well but if you describe “health care PR accounts manager” it means a lot. 2. Completeness: Recruiters look for a complete profile, when your profile is complete you stand in the first position. Once the recruiter has picked you and decided to look through your details, the recruiter would like to know what you did, where you worked, and what people think of you, so make sure not to skip out or laze out these things. The completeness of your profile is measured and suggestions will be offered by LinkedIn. 3. Summary: The LinkedIn profile summary is the one which is similar to your resume summary and hence it is advisable to the candidate to make the readers know what needs to be in the summary. The candidates core skills, accomplishments and specialty is to be listed in the summary. The candidate also has more chances of getting in the search result of the recruiter when job related keywords and phrases are utilized in the LinkedIn profile. 4. Picture: The main purpose for development of LinkedIn is to encourage conversation and engagement. When the profile has a name and picture, it seems pretty good to get connected. A clear, professional and friendly picture image is something that recruiters are looking for. A professional image is something recruiters would look at and judge the candidate. 5. Experience and skills: Recruiters would like to know how you can do the job and your level of competency. In the experience and skill section mention the way you have used your skills and your accomplishments till date. The candidates should make sure to present measurable and qualified results. Recruiters are searching for candidates based on skills and so make sure to include the key skills in this section and get certified. 6. Networking: Recruiters look for connections which has quality and relevance. Contacts should be ones related to the industry. When you have 50 or less contacts, it clearly tells the recruiter that you’re a paranoid, you’re a recluse with very few connections, and your scary about social media and technology. Have relevant contacts within your industry and try to join in groups and communities. The candidate should try to participate in discussions, seek help of connections and comment on articles. The candidates can also send direct invite to get connected. 7. Recommendations: When discussing about recommendations, it is like a pre check on the references. Recruiters would like to see if there are other professionals in the industry who guarantee your capability, skill and experience. The best recommendations can be your senior colleagues, supervisors, and clients. You can ask your contacts to write a recommendation on your LinkedIn profile. Another aspect to remember is that when you write a perfect recommendation, others would surely write for you. 8. Adding details that say you’re a high performer: High performers are ones which the recruiters are hunting for. Your profile should be formulated in a way it presents you as a high performer through your verbal, accomplishments, and other stuff that makes you stand out of the rest. Make your details powerful for which recruiters are looking at. 9. Show that you are engaged, passionate and excited: People who are excited about their profession are one which recruiters are looking at. Candidates can open up their enthusiasm by linking with groups and participants related to industry. Your status line should contain passionate lines related to the work you do. Show that you’re engaged and passionate by sharing articles and news related to your industry. Get connected to leader in your industry and present yourself to be motivated and passionate about work. 10. Using the right keywords: A LinkedIn profile should have a right mix of keyword according to your relevant position and industry. When you use the right keywords chances are there to get shortlisted as per the recruiters requirements. Recruiters also look out for the same in a candidates LinkedIn profile. 11. Numbers: It is a known fact that recruiters hunt for high performers throughout LinkedIn. To stand out of the rest and get noticed by the recruiter the candidate should have as many numbers as achievements. Try to add more numbers and accomplishments as possible; you can also add awards you won, and even courses that have recommendation from your colleague and lot more. 12. Facts: Work related experience and goals are something that should be in your LinkedIn profile. Details about the companies you have worked so far, your title, meaning of your title, dates from when you worked for the company, and more. 13. Clear career history: Apart from the facts, the recruiter must be able to figure out your career history from the few lines you mention in your LinkedIn profile. The mentioned details should present if your career experience would develop and show some sort of growth path, is the profile stronger or something should be added or removed, and what else can be done to complete my profile in a professional way. These are few aspects that need to be focused by the candidate to grab the attention of the recruiter. 15. Open to new opportunities: If you’re open to new opportunities make sure to mention in your profile as recruiters do not waste their time on candidates who aren’t interested in new opportunities. The candidate should make sure to mention “connect to me, I’m open to all opportunities” can be a good sign for recruiters so that they contact you. 16. Easy to read: With all the stuff, make sure that your profile must be easy to read. When the profile has a set of densely packed paragraphs it makes it difficult for the recruiters to evaluate and find out if you’re a best fit for the organization. Make sure to enter and white spaces amongst paragraphs. Bulleted list and points must be made use for achievements and accomplishments. Recruiters like to see expressive statements and impactful achievements. The candidates should make sure to use a professional photo in their profile. Recent studies have opened up that recruiters spend nearly 20 percent of their time glancing through profile pictures. This shows that first impression is the best impression. Updating profile on a regular basis is another important task to keep yourself active. Use few tips such as volunteering some groups, learning new skills, and joining up new clubs. Recruiters are looking for some important pointers as mentioned above, so candidates who have a LinkedIn profile or wish to have one may read through these useful tips so that recruiters pick to view them. Dedicate time and get yourself involved to build your personal brand. Present yourself to be professional and sell yourself amongst the corporate world. Climb the ladder amongst the tough competition and reach higher positions in career. Previous articleHow to Keep a Career Journal for Career Development? Next articleHow To Make a Big Impact in Your First Job Interview?